Karima El-Hamraoui and Abir. Lucy Gellman Photos. Abir was performing alchemy in The Hill. Her hands fluttered over a pile of red and white onion, fine salt and flaked sumac coating the slices. She spoke in quiet tones as she worked, recounting bits of information about her children. A family of sunflowers bobbed deferentially in the background. 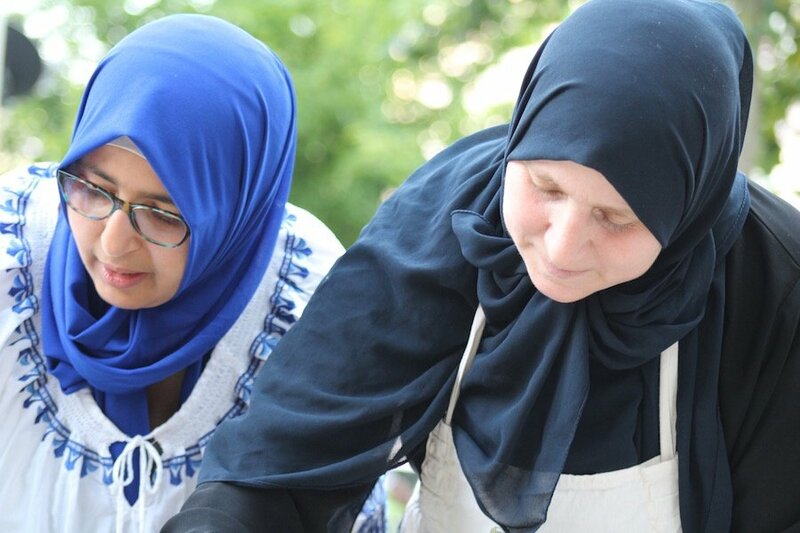 Abir is a Syrian chef at Sanctuary Kitchen, a collaboration among CitySeed and several refugee chefs and home cooks in New Haven. 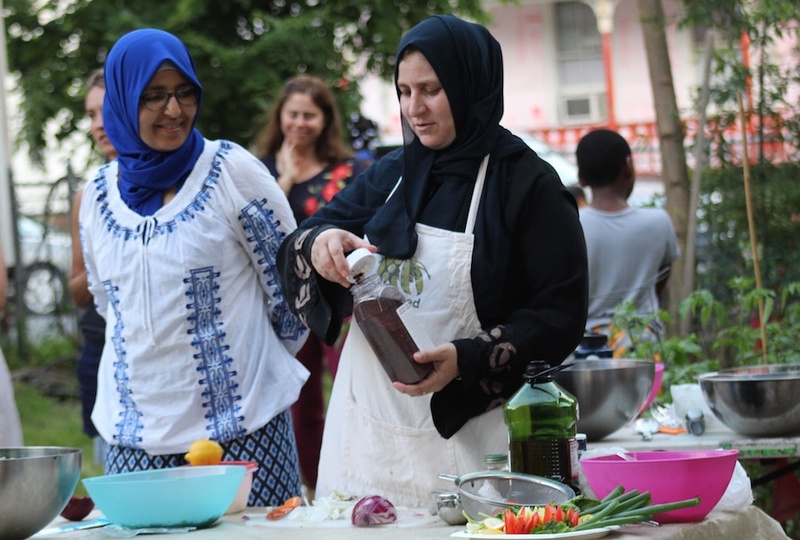 Tuesday night, the group held its second cooking demonstration and dinner outdoors, in a lush garden run by Amistad Catholic Worker House and New Haven Land Trust on Rosette Street. Tucked away in the city’s Hill neighborhood, the event drew close to 30 people for mutbal shawander (beet and yogurt dip), ful mudammas (Fava bean salad), and salata jareel, an arugula salad with blocks of salty cheese and slices of onion, lemon and tomato. A third and final summer session is scheduled for Sept. 12, following a fundraiser for the program later this month. More information will soon be available on the website and Facebook page. Salome Camacho and her husband, Rafael Ito. In a little over a year, Sanctuary Kitchen has grown to include a catering operation, business incubator, and increased presence in the community, branching out from home-based supper clubs and cooking demonstrations at CitySeed’s Grand Avenue offices. The garden sessions fall into that third category, said program co-founder Sumiya Khan—they’re built around reaching New Haveners who may not have heard of Sanctuary Kitchen, or can’t afford the program’s ticketed events. Across the garden—it is used daily by Herb Turner, who turns vegetables into free breakfast at the Worker House each morning—her words sprang to life. As a handful of kids played by red-tipped tomato plants and deep green chard, Abir slid behind a table with Karima El-Hamraoui, a language teacher and Moroccan immigrant who works as an interpreter with Sanctuary Kitchen. 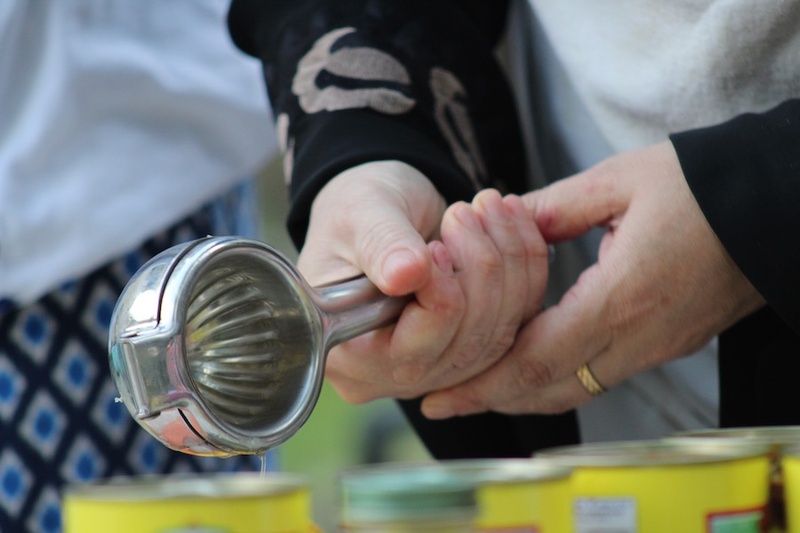 She motioned to ingredients for the dishes she’d be making, attendees passing around recipe packets that they could take home with them. Then she dove into the Mutbal Shawander, holding up a tupperware packed with boiled, grated garden beets to oohs and aaahs. The recipes are simple, Abir told the group—that’s where they draw their power. The beets, coated in yogurt and tahini and served with walnuts, are silken and refreshing before or after a day of hard fasting for Ramadan. The salad’s onions have no bite, because they’re tempered by sumac and then kissed with lemon. Anointed with cumin and olive oil, the Fava beans make full mudammas into a protein-rich breakfast dish, quick and cheap to put together. And the cumin isn't just for show, she added to laughs—it cuts bloating from the beans. 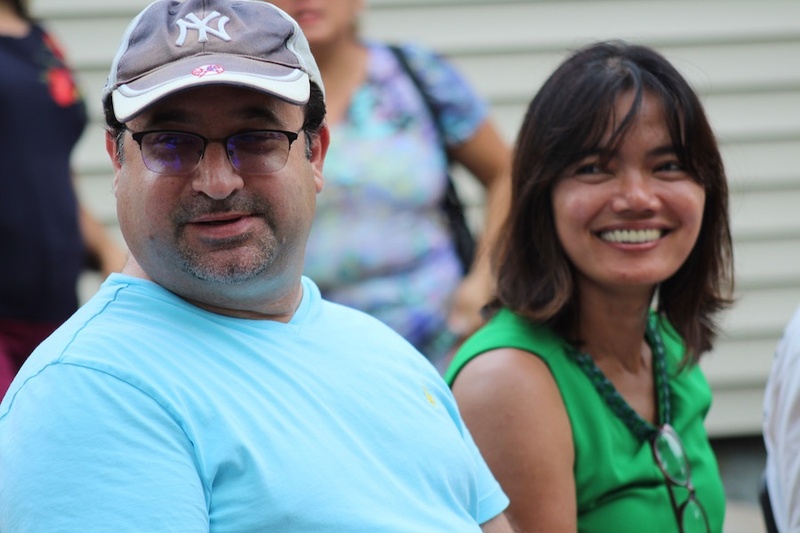 As El-Hamraoui translated from Arabic to English, New Havener Joe Foran translated the English into Spanish, several attendees nodding with the new knowledge. Questions bubbled up across languages. Is it okay to use raw, shredded beets instead of cooked ones? The answer: no. Some of Tuesday's attendees. One gentleman asked how to get beet stains out of white clothes—to which Abir laughed and suggested there isn't an answer. How do you know if your tahini is fresh? It shouldn’t separate or be too thick to pour. What markets are best for flaked sumac and Ziyad-brand Fava beans? Try the Syrian markets in West Haven. How do you get beet juice out of a white shirt? You don’t. As cooking went on, questions transcended dishes, dipping into the chef's background. 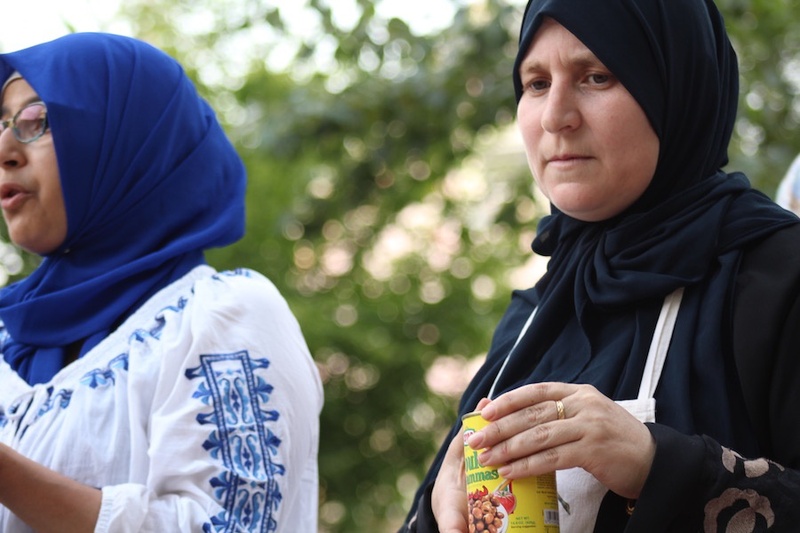 Originally from Syria, she spoke in a mix of Arabic and English about her time with her family in a refugee camp in Jordan, where she volunteered with kids from Syria while mothering her own. It was there, after four years away from their home, that her family was finally granted access to visas for travel to the United States. They arrived exactly two years and two days before Tuesday’s session. She regaled attendees with stories of her seven children: a medical student at Yale-New Haven Hospital, soon-to-be high school senior with special pre-college classes at Yale, talented computer scientist, two constantly curious middle and elementary schoolers and an infant. When the youngest gets older, she said she wants to finish school herself and become an ultrasound technician in the city. It’s a goal she started several years ago, when she earned a degree in sociology from the University of Damascus. Foran said that’s what the garden represents for him. 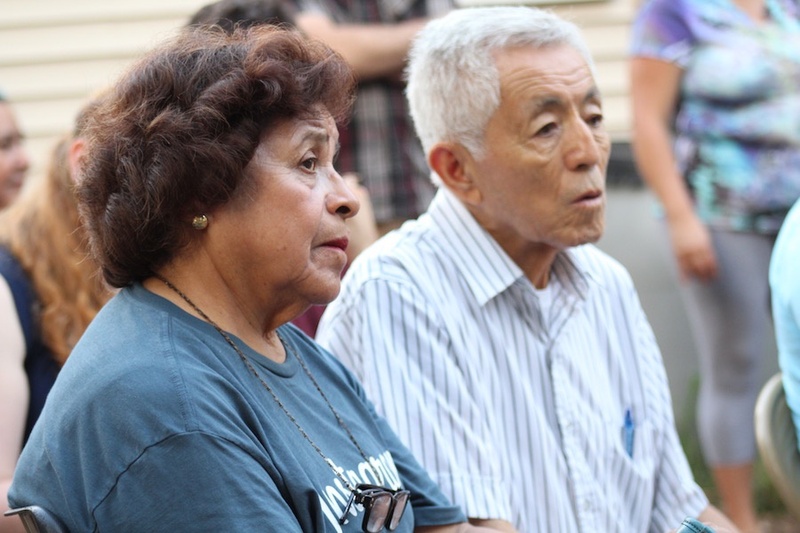 A healthcare worker and immigrant rights activist, he tends the plot with his partner Enedelia Cruz and Catholic Worker Luz Catarineau-Colville, getting help from the Land Trust to maintain the space. (Catarineau-Colville’s husband Mark, with whom she runs the house, is still awaiting trial in Georgia for an action with the King’s Bay Plowshares activists earlier this year). He said it’s an opportune time to be holding events that bring New Haveners together: the area around Rosette Street has been drawing both Guatemalan and Afghani families in recent years, in addition to the neighborhood’s already Black and Latino population. He said that he and others have been looking into the possibility of renaming the space the Land Trust/Amistad/Sanctuary Garden, as a symbolic gesture towards all who use it. Nearby, attendee Fatima Rojas agreed. As dinner wound down, she walked over to Abir and El-Hamraoui to thank them for dinner and chat about her own name, for which people sometimes mistake her as Middle Eastern. An immigrant mom and activist with Unidad Latina en Acción, Rojas said that the dinner stood out to her not only for the types of food, but mix of New Haveners present.